This week I wanted to write an opera, but first one thing then another got in the way and I never found that big block of time one might think necessary to the writing of something as grand as an opera. Perhaps I squandered my time. Perhaps I had the time and squandered it. The four robins, last Sunday. Every once in a while I get caught up in listening to opera. It’s kind of like when I get caught up in that sadness and grief thing—I am not sure where it comes from, why it hits me. I indulge, it goes away. I don’t understand it, have no idea what I am listening to, what it is all about. Most operas are written and sung in Italian or some other language I do not know. Perhaps that is part of its appeal. 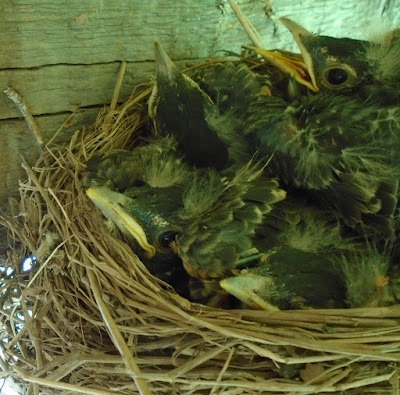 My opera was going to be about the baby robins. This week I got caught up in them, too. While I played my CD “The Best of Italian Opera,” Grubbs, Stubbs, William, and Fredericka (yes! 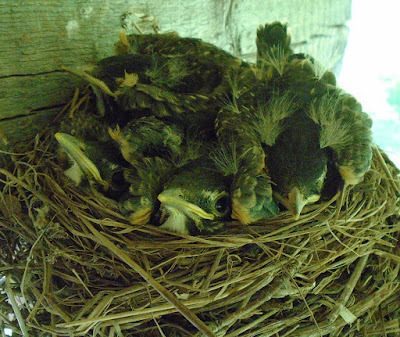 a fourth baby robin!) 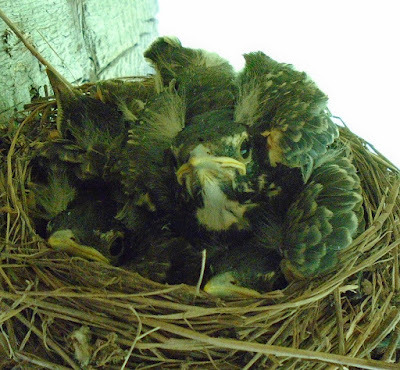 were growing like—apparently—baby robins. Which means swiftly. I continued to take a picture a day, and it was Tuesday when Fredericka appeared. At first her name was Jimmy-Bob, but a friend didn’t like that, so I changed it to Fredericka, and that could be what brought about the idea of writing an opera because the friend who didn’t like “Jimmy-Bob” also doesn’t like country music, so you see the connection. I never intended to write a real opera, of course, but rather a piece of writing simulating an opera. I even queried Google with something like “opera structure” and got a great hit titled “Operatic Structure” from a Professor Michael Dicker of Illinois State University. I saw no reason to search further, as I was only going to spend a few days on this, and Prof. Dicker presented it all so neatly. All I needed was an overture, a recitative, an aria, and a chorus. And my opera would need no more than one of each, as it was to be just a one-scene, one-act opera, an opera-ette, as it were. And now I remember I did squander some time thinking of fun terms like “operatita” and “operettatita” and the like. 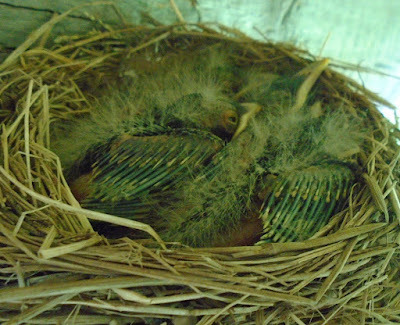 The four robins, Wednesday. Grubbs preparing for his aria. At first, I thought it was going well. One morning while walking Josie I composed an overture and then the recitative came easily. Where I got stuck was the aria. I had a theme in mind, but time was short. I thought I might cheat by finding an existing aria on YouTube or something, so I emailed an opera buff friend asking if he could point me to an aria with my chosen theme. While waiting for a response, I did some vague online searching, read some translations of lyrics, and realized, boy, I don’t even understand this stuff in English. I felt not so dumb, though, when my opera buff friend responded to my email saying he’d like to help, but he’s never quite sure exactly what it is they’re singing about … and believe me, this is a very smart guy. Anyway, I read somewhere that all arias are about love, but love is a broad topic, many sub-themes, perhaps that is why it is so interesting. 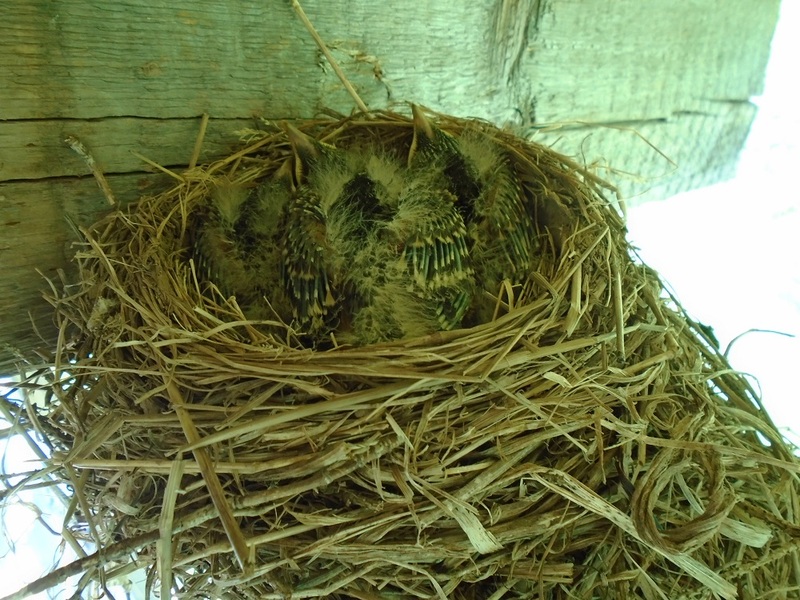 The four robins, Thursday. Grubbs is a little miffed. He thought he was getting the aria. Anyway, I ended up writing my own aria, to be sung by Papa Robin, and I might as well admit I did get the whole operatita written, but it’s pretty bad. Maybe if I spent more time on it. Yes. Maybe I will spend more time on it in days and weeks to come. Perhaps some week when 508 pounds of beeswax isn’t arriving from Iowa and a wheel isn’t falling off the new mower and financial matters aren’t demanding attention and there isn’t an order for 40 charmers plus all the rest and Josie isn’t attracting 10,000 ticks and the Cubs aren’t playing the Tigers and the Blackhawks aren’t in the Stanley Cup and the grass isn’t growing and the two main computer programs I use aren’t freezing up every day, “not responding,” they say, and I am actually using my time rather than squandering it. That’s when I will fix up that operette I once wrote about the four robins. Meanwhile, the robins were being efficient with their time, growing feathers and wings and bird brains and the like, and when I went out on the deck to get Saturday’s picture, they flew away. 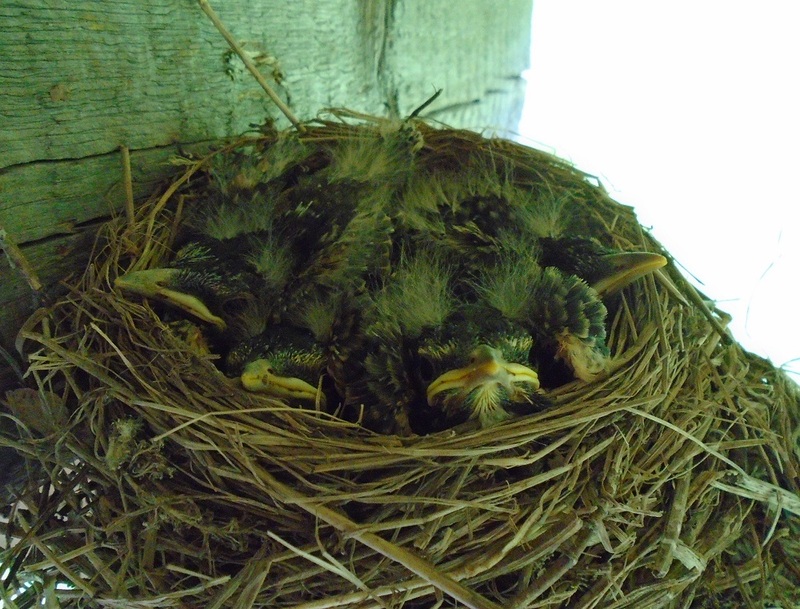 Grubbs, Stubbs, William, and Fredericka flapped their wings and flew, one by one, out of the nest. 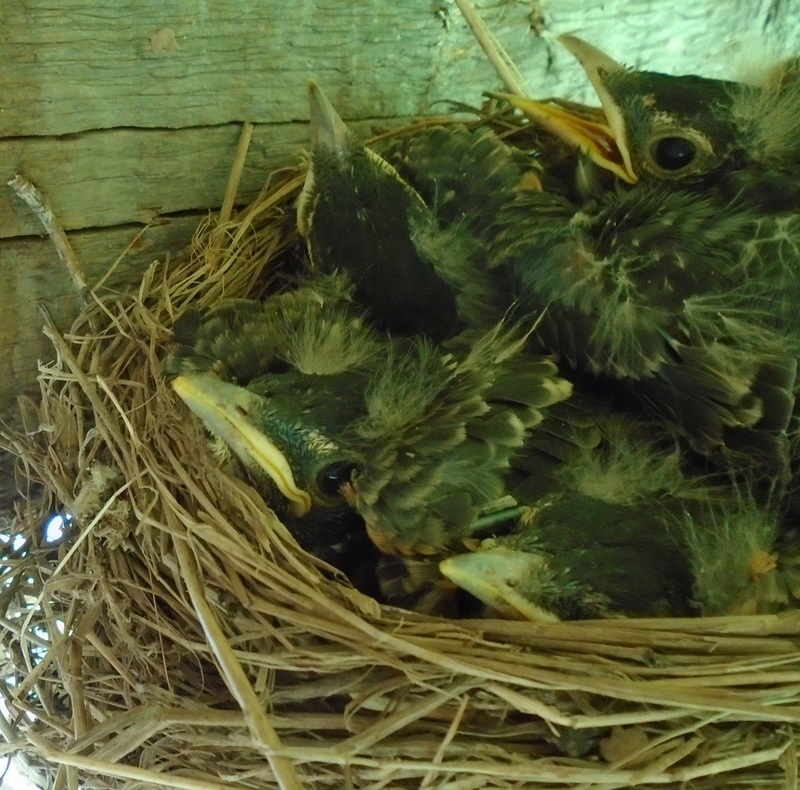 They landed in a tree a few yards off. 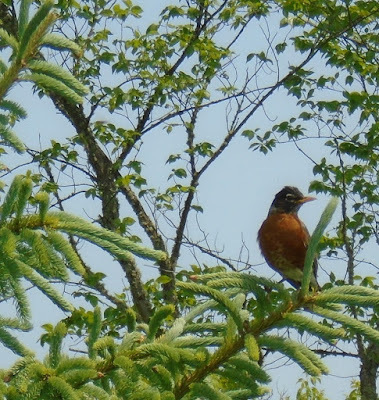 Missie Robin, who along with Papa Robin had been in the spruce watching the nest so diligently all week, flew off in all directions, chasing her young, yeeping and cucking and all that. So now the nest is empty. I feel like a schlemiel. 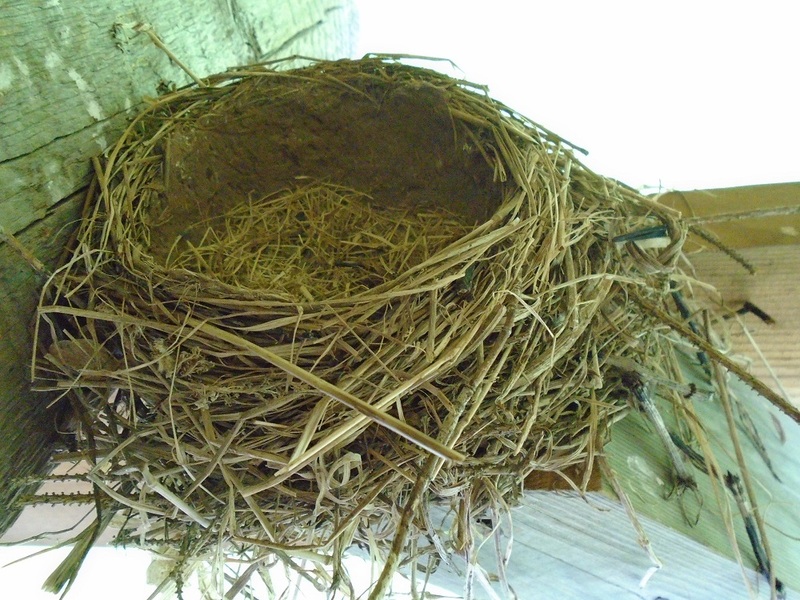 Yes, the nest was pretty full and it looked as if something had to give, that someone or two would have to go, but just because they could all fly, does that mean they were ready? And just because they can fly, does that mean they are safe? As safe as they would be if they were back in the nest? If I hadn’t scared them? Made them all fly off? Do I ask too many questions? I feel as if we blunder along, some of us, me, not knowing, not understanding, listening, thinking we’re listening, but not understanding, and we act from such good will and intention, but we blunder and stumble and squander and so much of it can be laughed at, in the end, when we realize the comic opera of it all, but until then, until you get it or get past it, when you’re still just in the midst of knowing something’s wrong, but what?, it’s like listening to an opera. You hear it, you don’t understand it, you feel it. That’s all.